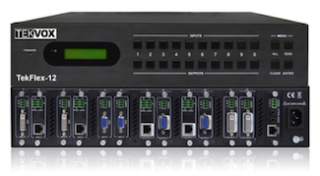 The What: TEKVOX will debut its TekFlex-12 seamless high-definition switchers, which replace all inputs and outputs with 12 individual slots that can be independently populated, at its InfoComm booth, N1715. The What Else: TekFlex-12 users are no longer limited by the number of fixed inputs or outputs or the fixed type of connection options in most presentation switchers. With TekFlex-12 providing 12 card slots with flexible I/O combinations, users just pick the input and output cards they need and plug them into whatever slot they wish. The system automatically recognizes the input and output cards. TekFlex-12 offers comprehensive signal card compatibility with 3G-SDI/HD-SDI/SDI, HDMI, HDBaseT, DVI, and VGA inputs and outputs. Hundreds of potential port allocations can be configured in the 12-slot system. TekFlex-12 is designed to be easy to install and control, easy to operate, and easy to integrate with lecture capture and videoconferencing equipment. TekFlex-12 has multiple control options: a high-sensitive LCD touchscreen control, GUI control with a simple interface, and a front button panel. It also offers easy and powerful EDID/HDCP management over the web. Additionally, the product can be controlled via RS-232, IR, or ethernet, utilizing the TekMonitor and TekTouchPad products. Seamless switching is achieved with no delay, no flickering, and no screen blanking, according to the company. Audio may be embedded and de-embedded depending on the interface options chosen. The system also has hot-plug support without power off. Firmware is upgradable via the USB port. The Bottom Line: The TekFlex-12 flexible matrix platform can be implemented as a preconfigured system or customized in the field to adapt to project-specific needs. It can be reconfigured at any time, by changing the input and output cards and setting the configuration. It is well suited for small- and medium-sized conference rooms with the potential to provide easy, seamless switching for users’ laptops, big- and small-screen displays, and projectors. The TekFlex-12 is also a great solution for the rental and staging market.